“It is mandatory to learn new things to adapt to the changes happening around yet the goodness of traditional knowledge must be continued to be practiced. Stuck between old and new I decided to stick to the goodness of each and merge the two in the favour of my farm growth. 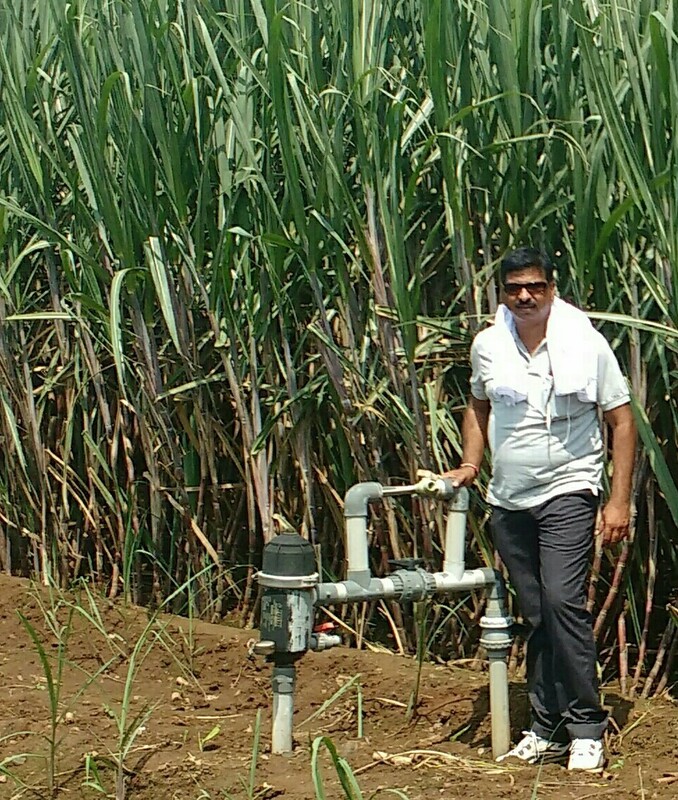 I turned into 100% traditional (organic) farming practices to produce best quality sugarcane, set-up latest machinery to make chemical-free jaggery, brown sugar and vinegar from sugarcane and utilized internet technology to market and sell all value added products directly to the end consumer. It increased my income by many folds and gave consistent growth to my farm,” shares Mr. Rakesh Dubey, farmer from Kartaj village, Narsinghpur district, Madhya Pradesh. His farm ‘Kushal Mangal Jaivik Kirish Farm’ spreads in 16 hectare in which 38 acre has sugarcane cultivation and in the rest of the area seasonal vegetables, grains and legume crops are grown. Entire farm acreage is under organic cultivation. Mr. Dubey has included diverse elements of integrated farming to make it self-reliant such as small dairy unit of 4 local breed ‘Malav’ cows (native of Madhya Pradesh state), vermicompost and forest trees. 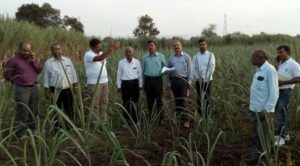 He took up commercial farming in the year 1990 and has been felicitated with many awards for high sugarcane production precisely 1000 quintal/acre. However he left it all instantly and turned into organic farmer, “I didn’t find use of chemicals in farming enduring for long term as the quality of sugarcane was not as desired, soil heath was deteriorating and life of living beings consuming this produce was under threat to many diseases. Thus since 2012 I changed my practices to 100% chemical free farming, he adds. Powdered jaggery, liquid jaggery, brown sugar and vinegar are produced at the farm from sugarcane. These products are sold under the brand name ‘Kushal Mangal’. Mr. Dubey does the marketing of these products on his own by using the social media and online marketing tools. As a result he has good sales of these products that have multiplied his profits. “I come in contact with bulk buyers and retail consumers in all parts of India through website and social media like facebook page. I am also selling these products regularly through Amazon,” he shares. 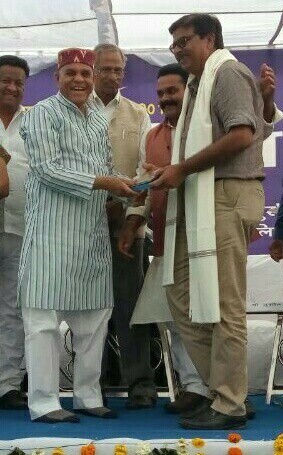 He started value addition of sugarcane in 1996 with jaggery processing but it being inferior quality he got less price. Conversely after 2012 even when the farm was in conversion period he started getting good demand for organic jaggery. “We started making the jaggery in the natural way without adding any chemicals. Above all after the post conversion period in 2015, most important advantage we got from organic farming is that the quantity of jaggery produced from 1 quintal sugarcane increased. Earlier from chemically grown 1 quintal sugarcane we used to get 12 kg jaggery but now with 1 quintal organically grown sugarcane we get 16 kg jaggery. We not only got superior quality and minimum input cost but also the quantity increased. Besides organic jaggery is sold at premium price,” he highlights. Sugarcane processing plant at the farm has the capacity of producing 350 quintal jaggery per day. The capital investment made was Rs. 10 lakh. Jaggery is produced from November-February. During the monsoon the same plant set-up is used for making vinegar. “In the period of July-October we make the saplings in the nursery for next crop cycle using the cane-setts. The left over cane-sett is waste but we utilize it for making vinegar. It is a surplus for us. Vinegar is best in quality and is selling through advance orders. Similarly we make hand-made brown sugar without any chemicals like sulphur. Our brown sugar contains only 74% sucrose, fit to be consumed even by a diabetic patient,” he states. To increase the farm production in organic farming Mr. Dubey recommends change in the farming technique. “We choose to increase the age of our sugarcane crops to 18 months. To do so instead of planting the cane setts directly in the soil we first prepare the saplings in our own nursery. Then these saplings are transplanted in June month keeping plant-plant distance as 2 feet and row-row distance 6 feet. In 18 months trenching is done 11 times. Consequently the yield obtained is 865 quintal/acre,” he elucidates. Speaking about the agri inputs in the farm Mr. Dubey says, “Every crop cycle gives three outputs after harvesting viz one for the grower/farmer, second for cows and third for farmland itself. This third output is referred as farm waste that is obtained in ample quantity. It is decomposed along with the dung and urine of cows to make manure, bio-pesticides and insecticides for the next cycle. We are self-sufficient for making agri inputs within the farm. When we started organic farming in 2010 the carbon content of our farm was 0.27 and now it is increased to 1.01. This increase in organic carbon of our farm is our strength, our income.” As the entire farming practice is consciously chemical free the soil and crop have become resistant to disease and pest attack. His future plans are expansion and increasing farm production keeping the farming practices strictly organic. “I also want to encourage 500 more farmers to set up a farm like mine and we all would work under one group. The objective is to increase the production of organic produce so that the selling price can be reduced. Every year on my farm I am trying to increase the production and decrease the cost but to bring a revolution of healthy and nutritious food I need more farmers to join me. I will continue my struggle till the prices of organic produce drops!” he signs off.